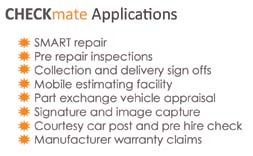 CHECKmate is AutoFlow’s mobile estimating and damage appraisal tool designed for use on PDA’s and SMART phones. This latest offering from one of the industry’s leading solution providers, harnesses the power of touch screen technology and the latest in internet communications. Streamlining current industry practices whilst ensuring the user maximises potential upselling and marketing opportunities. The product was launched at the BODYSHOP magazine event at Hilton Birmingham Metropole in the summer of 2009. Since its initial release it has emerged as one of the most exciting developments in the industry and uptake of the product had exceeded expectations. In a year when economic pressures have generally meant people cutting back on their expenditure, the innovative nature of the product and its ease of use has led to people reviewing their work procedures to take advantage of the potential benefits that CHECKmate befits them.